Learn why you're just 10 days away from a recharged, energized and "feels like new" body! Would You Try This for Just 10 Days? If you have, there’s already a chance you’ve tried other programs, fad diets, challenges, and quick fixes “guaranteed to help” in just a few weeks. And, if you’re like most people, you don’t have the time, effort, or motivation to go through another 30, 60, or 90 days of grueling workouts and starvation dieting to see if it will actually work this time. 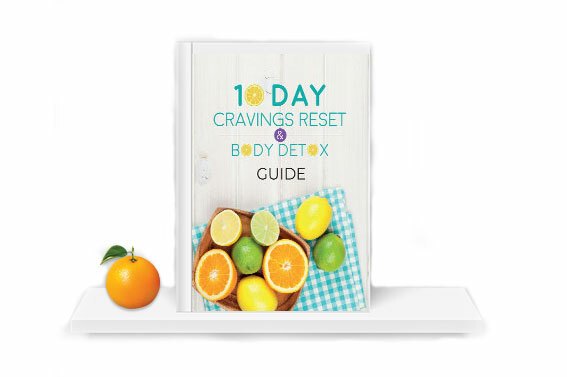 This complete Cravings Reset & Body Detox will help you rebalance your hormones and take back control of your metabolism using the power of whole food eating and toxin elimination. The complete Cravings Reset & Body Detox takes just 10 days, but you don’t need to wait all 10 days to experience lasting results. As you follow the included guide, meal plans (adaptable for all diets – vegan, vegetarian, gluten-free and paleo diets), and support materials, you’ll discover a faster way to feel refreshed, full of energy, and healthier. 8 “Can’t Eat” Foods you’ll avoid for the next 10 days. Yes—It can be tough to cut these out, but you can do anything for just 10 days. Improve your digestion with proper food combinations, yoga poses and breathing techniques so you have more energy to put toward the things you love. Create a deeper understanding of your body’s signals through yoga and meditation so you know how to take care of your needs. Use yoga to calm your mind, reduce stress, and improve digestion so you can be present and enjoy life more. Phase out unhealthy foods with ease, while still feeling happy and satisfied, so you feel light and energetic every day. 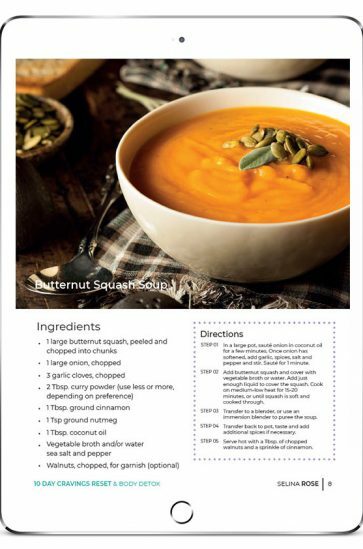 Digital Everyday Eats Cookbook: Upgrade your meals with ease using the quick and delicious recipes from my Everyday Eats Cookbook. Let the full-page colour images entice you to try something new in the kitchen. 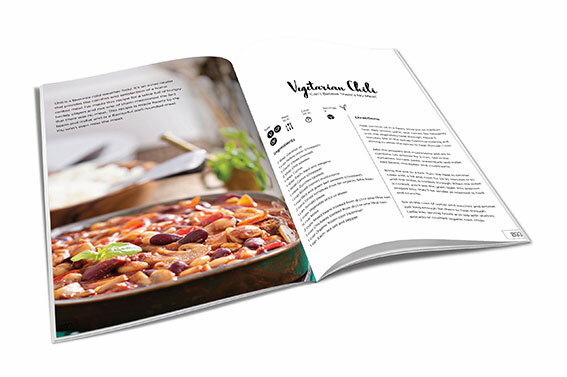 Includes over 40 recipes that are gluten-free, dairy-free with a mix of vegan, and meat meals. Balance Your Blood Sugar and Discover a Hidden Energy, Motivation, and Metabolism You Never Knew Was In You. I feel healthier and more comfortable in my skin after completing the detox. Before the cleanse, I was used to putting everyone’s needs before my own. This gave me the opportunity to do something for myself. Doing the cleanse with Selina’s daily yoga routine was a really great addition to the program. It gave me an excuse to have quiet time. This is something I’m going to continue. I feel great for the first time in a long time! This detox is nothing to be afraid of! It took a bit of willpower to get started, but by the end of the 10 days I barely noticed I was on a cleanse. Except for the fact that I felt great! My clothes fit better than the have in months and my skin is bright and clear. I’ll be doing this detox again next year! I never realized how much time I spend thinking about food! One of the (unexpected) blessings of this detox was that my meals were all planned out for me. I didn’t have to think. It was as much of a mental break as it was for my body. I feel light, energetic, and I don’t even miss coffee! The recipes in this program are so delicious! I went from having constant sugar cravings, eating chocolate at night before bed, to feeling full and satisfied in just a matter of days. I feel like I’ve done the impossible! This detox literally turned off my cravings. I feel like a new person with a new lease on life. The 10 Day Cravings Reset Detox opened my eyes to a new way of eating and I LOVE it! I’m cooking my own food using the recipes, which are so simple and flavourful. For someone who doesn’t like to cook, this was really easy to follow. I enjoyed the Everyday Eats Cookbook as well, there are so many new recipes to try. I’m hooked! RESET YOUR MIND, BODY, AND METABOLISM? The value in this program is unrivaled. One of our guiding principles here at SelinaRose.ca is over deliver on everything we do, and the 10 Day Detox program is a wonderful example of this principle. For as long as I can remember eating felt uncomfortable—stomach pain and bloating after every meal. My body and I were at odds; I was young, ambitious, and frustrated that I had no energy to make it through the day, let alone put my ideas into action. As it turned out, making one big dietary change was the first of many shifts I’d need to make to regain my health. In addition to a new way of cooking, I was faced with things I hadn’t considered, like learning to say no, and to stand up for my health as the only gluten-intolerant person in social circles. I was learning to respect my body, and instead of fitting in, I was learned to fit out. Yoga helped me strengthen my digestion and my relationship to self. It gave me a pathway inside to get in touch with how I was feeling, and the confidence to make better choices. As I healed my digestion, I felt more energetic and optimistic about life and started to love and respect my body in a way I hadn’t known was possible. 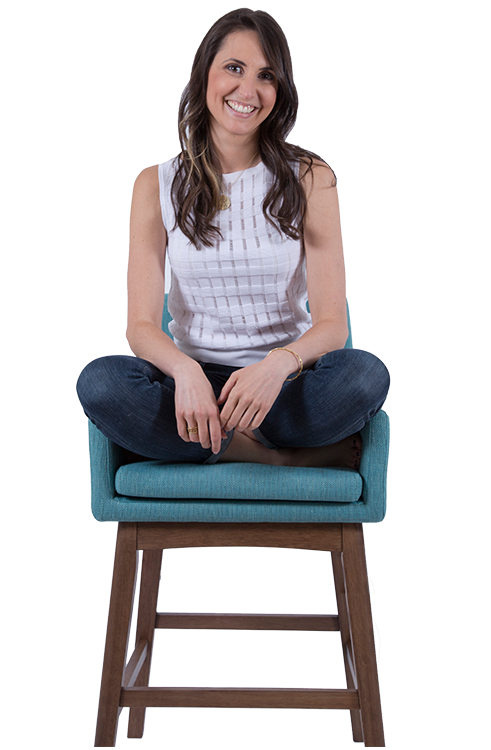 Now, as a holistic nutritionist, I teach people who want to have more energy, lose weight, and resolve their unexplained digestion issues, how to connect with their bodies through yoga and nutrition, so they feel confident in their food choices, love their bodies, and can contribute to the world in their own way. I’m happy to give you your money back, but what I won’t do is let you sell yourself short on improving your health. If you show me that you made the recipes, tried the first few days of the detox, and put in the effort…but for some reason it didn’t work for you, I’ll refund you the entire cost of the program. It’s my mission in my work to be useful and to offer great value for every dollar you spend on a program with me. It’s also my mission to hold you accountable to the highest standard of who you can be. If you give this detox your honest effort and you try the recipes and implement this cleanse and you don’t feel lighter, healthier, cleaner and more clear-headed afterwards, write to me for a refund. That’s my 100% money back guarantee. I’m confident that if you show up for yourself, this program will take you to where you want to be. It’s ok to want to try something new without the risk. If you participate in the sessions and implement the recommendations, but by the end of the program you don’t feel it has delivered on its promise, you’ll get your money back. All of it. No questions asked. You can even keep the course notes. What happens after I click "buy"? How much time do I need to devote to the 10 Day Detox? The total program takes only 10 days to complete, but you can read all the materials in an evening. You’ll want to give yourself some time in advance to prepare and have all of the required fresh ingredients on hand. I also understand that life can be busy and full immersion right away might not be possible. That’s why you’ll have lifetime access to the 10 Day Detox content. You can repeat the detox over again at any time, or just complete the first 3 days as a smaller re-set. I haven't done a program like this before... is it still for me? Tell you what, I wish I’d had all this knowledge BEFORE I began my journey. For starters, this content will give you tremendous clarity on how to super-charge your overall health. And secondly, you’re going to learn my personal secrets about accessing untapped energy you didn’t think you had. The 10 Day Detox comes with starter guides that will introduce you to new foods and recipes that show you how to use them. Whether you’re a beginner or a seasoned healthy eater, you’re in the right place. Always follow the advice of your medical doctor, and above all, listen to your body when you’re on the program. If something feels wrong, stop and consult your physician. What if I don't have time to go through all the material now? No worries at all. You’ve got lifetime access to the 10 Day Detox Program, so you’re free to complete the program when the time is right for you. (And frankly, completing the detox at least twice per year is a great way to reset and recharge your body). Are there any special tech requirements to access the materials? Nope — all you need is an internet connection and you’re good to go (and yep — that’s on any device). You can download and save the PDF content and/or print it out so you can reference it offline. How do I know if the 10 Day Detox is the right place to start? The 10 Day Detox program is designed to be a perfect compliment to any of our other services (1 on 1 coaching, Eats & Asana course, etc.). It is a program that you buy once and can use forever, referring back to it’s content and recipes over and over again. We could all benefit from a detox and re-set, no matter what stage we’re at in our health journey. Your results are entirely in your hands. If you don’t follow through, you’ll still have learned a lot but you won’t actually see the physical shifts you’ve been craving. However, if you choose to TAKE ACTION on what you’ve learned, I’m confident you’ll be blown away by what you achieve. Have more questions? Need help registering? 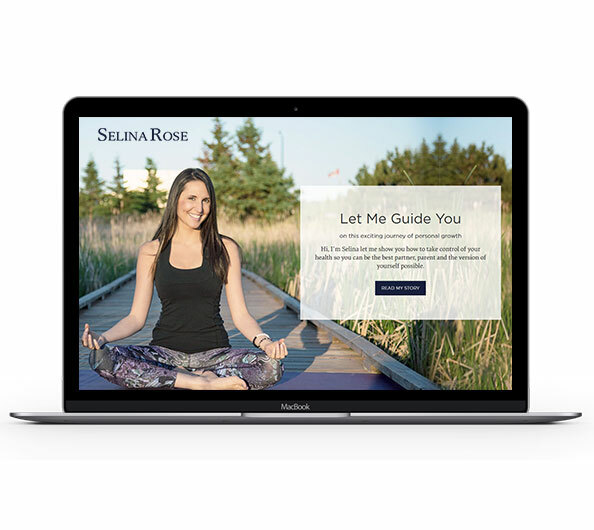 Send us an email, we'll be happy to help: hello@selinarose.ca. We believe customer support should always be provided with a smile with a side dish of patience. You’re not a guinea pig. 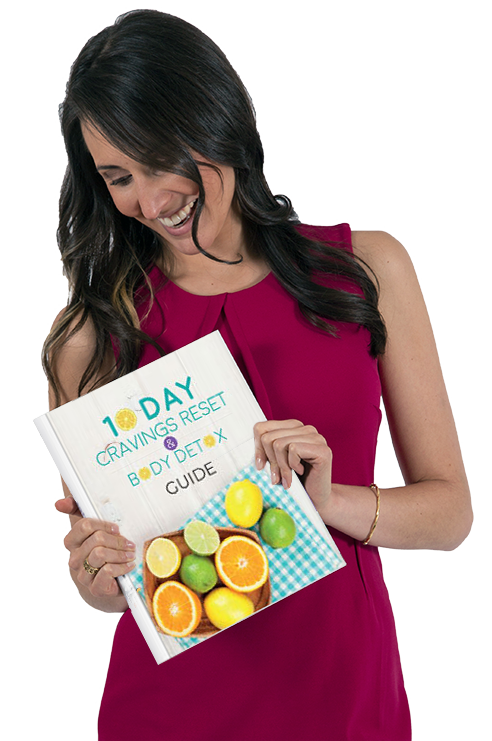 The 10 Day Craving Reset & Body Detox system has been tested with proven results. You’re not purchasing wishy-washy theory. You’re get actionable strategies you can put into practice immediately. Whether you use a PC, Mac, tablet or smartphone you can easily review all the information at your leisure and convenience.